For several years, I was a division commissioner and later player agent for our area’s Little League baseball organization. The most stressful time each year was the team formation (for the younger kids) and tryout (for the older ones) process. One group of parents complaining loudly about the coach and their children’s teammates. Others blaming the surely Machiavellian league of ‘stunting’ their child’s development because their ‘clearly exceptional athlete’ was not drafted into a higher division. And, yes, even accusing me of denying their child the “unalienable right to play baseball” because he was drafted onto a team by a coach he didn’t already know and, horrors, with some kids he didn’t already know and therefore would not be interested in playing. It’s pretty clear that the tryout process is a stressful one. But for whom? As far as I could tell, the kids were just happy to be playing. The parents, however? Completely wound-up. As we move into the spring sports season—baseball, softball, lacrosse, tennis, and year-round soccer leagues—here are a few tips for sports parents to manage the stress of tryouts and keep your kids focused on why they are doing this in the first place: to keep playing the game they love! Make Sure Your Child Gets Lots of Rest and Eats Well – As with most things in life, kids feel stronger and more confident at tryouts when they are well-rested and have eaten a light, healthy snack before the tryout. No donuts, cheeseburgers, or MSG-laden Chinese food, thank you. Try a banana and a granola bar or something similarly healthy. And the same goes for you, mom and dad. You’ll feel better and more relaxed if you’ve slept well and eaten healthy, too. Don’t Be a Toxic Parent – I’ve been accused of being anti-social when my own child is trying out for a team. Personally, I prefer to leave the field or court rather than sit in the stands and analyze every move the coaches and kids make. I also think it makes my kids more confident and relaxed during the tryout if I’m not there. But if you do choose to stay, don’t start gossiping with other parents about the players, the coaches or anything else related to the tryout process. It’s just going to end badly for someone—generally you and/or your child. Coaches will and do avoid selecting a child if the parent is seen as toxic. Be bigger than that and let your child’s skill speak for itself. Build That Lemonade Stand – Ok, so your child wasn’t selected to the ‘A’ team or didn’t make the travel team so she’s going to play in the recreational league again. News Flash: the world is NOT going to end! Whatever you do, don’t yell at your child or tell her she’s not good enough. I’ve seen this and it’s horrible. Instead, focus on how she can turn the experience into a positive one. For example, a boy I know didn’t make his premier soccer team the following year and was bumped to the next team in the league. Yes, it stung at first. But he ended up having “way more fun because he scored like crazy, loved the coach and the players, and the other parents loved watching him dust the defenders! The experience was a huge ego boost and confidence builder,” according to his mom. If you help your child see the experience as a chance to be a leader, you’ll give him a gift that will last beyond his playing years. 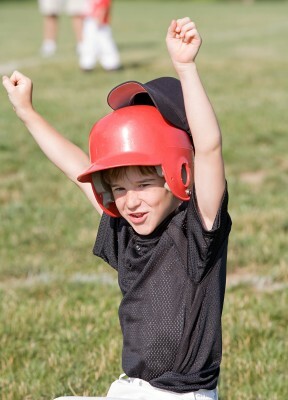 Do YOU have any tips or tricks that help you stay calm and keep the youth sports tryout process in perspective? I’d love to hear them!